What's Green in Granite City? 19th and State streets, the planned location for downtown’s first rain garden. 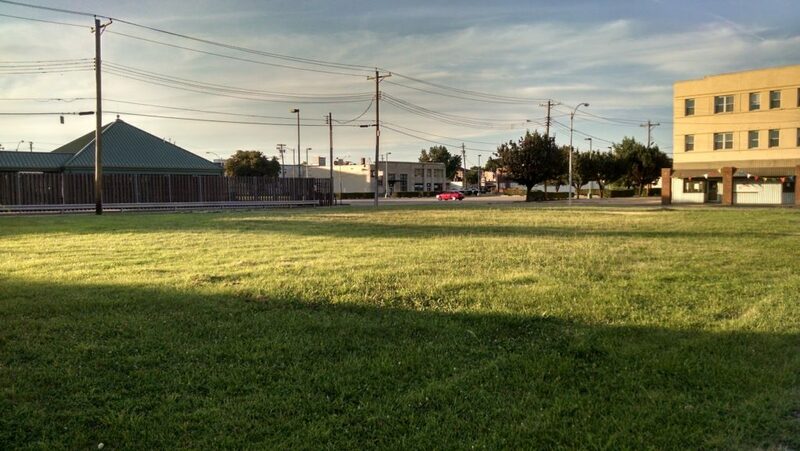 In May, the City of Granite City received word that it would be the beneficiary of a $15,000 grant to install a large rain garden and native plant installation at 19th and State streets downtown. The grant was awarded by the Madison County Planning & Development Department’s Sustainability Grant Program which is intended “to serve the community by providing support as well as promoting best management practices and case studies of sustainability within Madison County.” The grant program is funded by local landfill tipping fees. Pilot Plot Makes the Cut! Conceptual rendering of the planned rain garden. The project being funded with the grant is Pilot Plot. 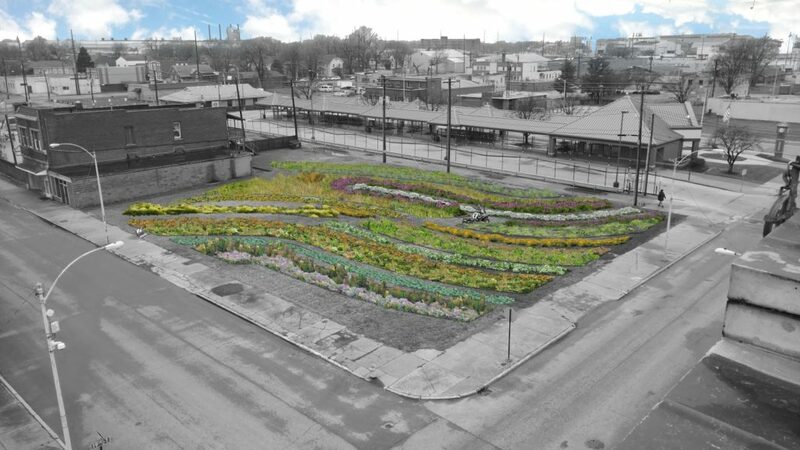 As Granite City’s sustainable landscape case study, Pilot Plot will demonstrate the use of rain gardens and native plant installations to limit stormwater runoff, create pollinator habitat, and beautify underutilized lots. The project is a collaboration with the Granite City Art and Design District’s New American Gardening project which is exploring native plant propagation and rainscaping as an integral part of renovating the 1800 block of State Street. 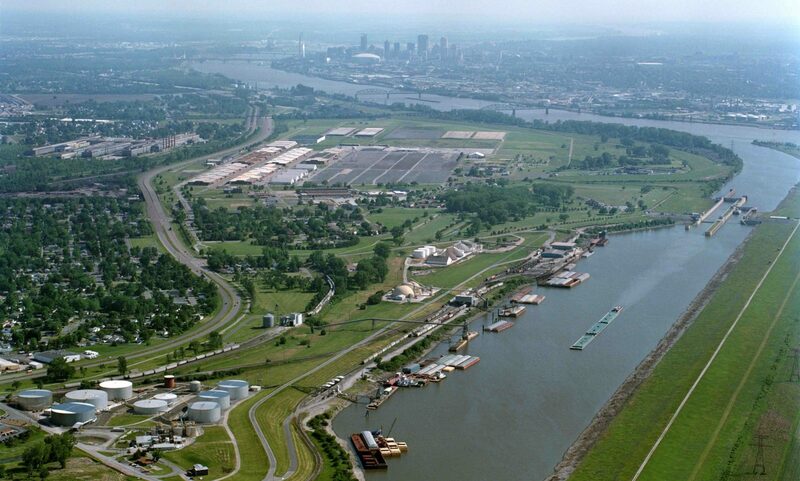 If you or your organization is interested in participating with the project please contact James Amos, the Granite City Economic Development Director, at jamos@granitecity.illinois.gov. 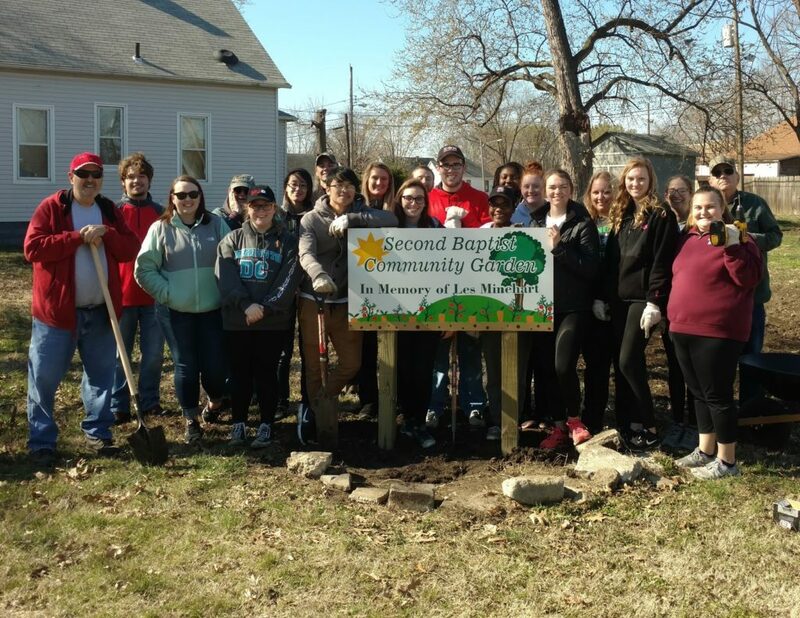 Jeff Rains is pictured with SIUE volunteers after installing the new sign in spring 2017.
garden. The garden is also used as a TWIGS site which provides free lunches to kids everyday during summer break. The garden can always use volunteers to assist with planting, harvesting and weeding. To find out more about the community garden or the TWIGS program please contact Jeff Rains at jrains4usw@aol.com. The students and staff of Prather School have been working hard to make our planet a better place, and all of their hard work paid off. 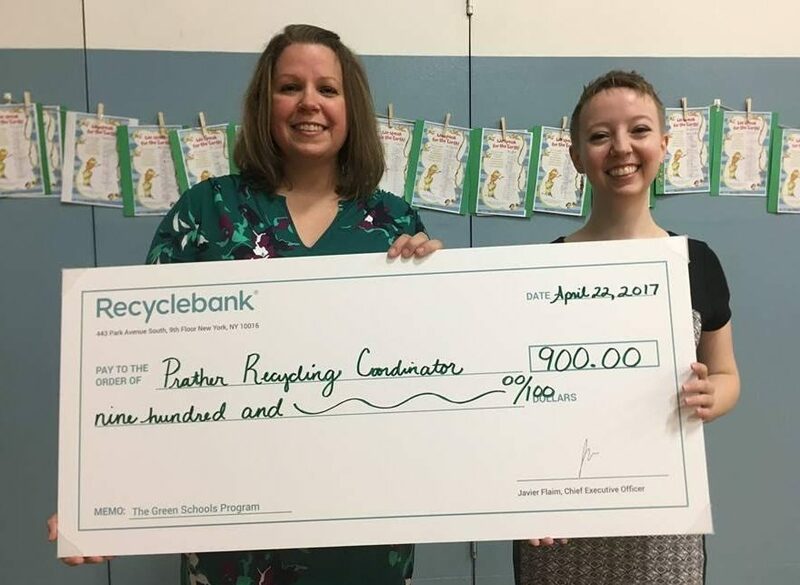 As students of this local school have learned about ways to help our planet, they’ve also begun a recycling campaign, a soda tab collection, and have made plans to install a community garden. In fact, each student has signed a class pledge vowing to do their part to take care of our environment. After all of their hard work, the whole school gathered for an assembly on Monday, April 24, 2017. The program started with a lovely song about trees that the students sang. After, the students watched a video named “What is Environment and how to keep it clean.” Each class presented their signed pledge. Ava Reagan received a Earth Protector Badge, a certificate, and a $20 gift card for collecting the most soda tabs. Overall, the school collected 89 pound of tabs. Ava, herself, brought in 20 pounds of those. Then the big moment arrived. Emily Leftwich from Recycle Bank awarded the school with $900.00 to start their community garden. As part of the recycling program in Granite City, each citizen is welcome to sign up for a free Recycle Bank account. The citizens earn points for recycling, reading articles on the environment, and other activities. Once someone earns points, they can use them for discounts on green products, or donate them to different causes. The citizens of Granite City donated 225,000 points to Prather School. Since 250 points are worth $1.00, the school earned $900.00. To conclude the program, each student was given a Red Maple sapling to plant and instructions on how to care for the tree. Have you signed up for your Recycle Bank account yet? Go to https://www.recyclebank.com/.